REMO drumheads allow me to get any sound that I can imagine. The industry standard, these are the most recorded drumheads in history. I am proud to be a part of the REMO family as both a Drumhead Artist and a Drum Circle Facilitator. I look forward to growing as an Artist and Facilitator while always making REMO a part of my sound. Bruce, Chris and John are the wonderful people behind these great products, and I am proud to be associated with them. Zildjian cymbals are the finest on the planet, period. All of the drummers that inspire me play Zildjian. I have never played another cymbal during my career, and I never will. 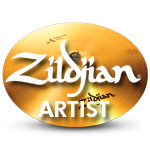 I appreciate my roster spot on the Zildjian Education Team and look forward to many years using “the only serious choice.” The people at Zildjian are as amazing as the cymbals. Kirsten and Adam are as good as they come, it is an honor to be a part of the Zildjian Team. Yamaha makes some the finest instruments available. Most of my favorite drummers made their landmark recordings on Yamaha Drums. Greg Crane has a passion for music and education that equals my own, and I am looking forward to a long relationship with him and Yamaha Drums. I am pleased to play Vic Firth sticks. Quality, innovation and tradition come together to create a stick that allows me to create music without thinking about what is in my hands. My career has a wide variety of musical demands, and Vic Firth makes a stick, brush, mallet or other implement for everything I do. Neil and Christian are the amazing people behind these amazing products, can’t say enough about them! Cympad allows me to hear my cymbals the way they were meant to sound. The full range of my Zildjian Cymbals can be heard like never before. Increased sustain, more harmonics, better feel for me…Cympad is the real thing….so simple…SO HUGE!!! Kotz Cajons are fine quality musical instruments hand made with care. I look forward to each gig I use Cajon on because I know how great my Kotz Cajon is going to sound. Michael makes each of these instruments with the knowledge of a craftsman, and the passion of an Artisan. Big Bang Distribution supports me with all of the necessities for my drum set. From Moon Gel to Bass Drum O’s, Jeff at Big Bang supports me with quality gear. I appreciate all that Jeff and Big Bang do for me, great gear, great guy check out their site.